For the past 69 years, the annual Fred Hall Fishing Tackle and Boat Show has been a season-starting tradition for Southern California outdoor enthusiasts. The Fred Hall Show spotlights the latest must-have sportfishing gear, tackle, fishing boats, marine accessories, camping gear and diving, shooting and hunting products, along with hundreds of resorts, landings, lodges and outfitters that are ready to book outdoor adventures. This year’s show is scheduled to run from March 4 to 8 at the Long Beach Convention and Entertainment Center, located at 300 E. Ocean Blvd. The Fred Hall Show will host the California premiere showing of the new Ranger Tug 29 Sedan. Represented by Long Beach Yacht Sales, the new Ranger Tug 29 Sedan is another masterpiece of innovation. The new Ranger Tug 29 Sedan features modern styling, a curved front window and an overhead glass atrium that provides exceptional visibility from the helm station and salon area. An ingenious aft cockpit seating arrangement includes a reversible seat, port and starboard jump seats with a teak table for outside dining. The opening cabin bulkhead with reversible seat also provides additional cockpit seating while bringing the outside-in. Guests can sit comfortably on the vessel since the Ranger Tug 29 Sedan accommodates up to six adults in three separate berths, including the forward island berth with en-suite head. The Ranger Tug 29 Sedan is powered by a fuel efficient 260 HP Volvo Inboard Diesel engine that is located outside of the cabin for quiet cruising. Standard stern and bow thrusters make docking exceptionally easy. The new design is a result of customer input that asked for many of the Cutwater Boats features — Fluid Motion builds both Ranger Tugs and Cutwater Boats — to be incorporated into the design of the Ranger Tug. Special introductory pricing will be available during the show and while the new Ranger Tug 29 Sedan will be open for viewing, appointment times will be honored so that prospective buyers will not have to wait in line to view vessel during the show. Contact Long Beach Yacht Sales at (562) 431-3393 to schedule an appointment or with any questions that you might have about Ranger Tugs and Cutwater Boats. Fred Hall Show guests can jump aboard the fishing vessel, Independence during the show. Based out of San Diego, the 112-foot long-range fishing vessel’s main purpose is to take anglers on extended three to 15 day fishing trips. Usually out at sea on extended trips, it is unusual for the vessel to be available for public tours, making the Independence a popular attraction at the Fred Hall Show. There are no scheduled tour times. Guests simply walk across the Hyatt Hotel bridge to where Independence will be docked. Patrons can find out more about one of the premiere vessels in the legendary San Diego long-range vessel fleet from Independence operators who will have a booth inside the show. 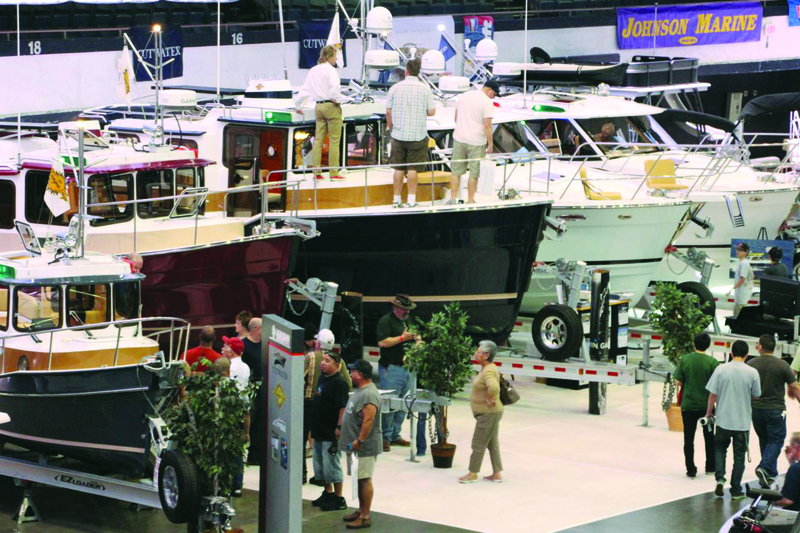 The Fred Hall Show is now California’s largest boat show with more trailerable boats on display than ever before. The entire Sports Arena and a significant portion of the lobby and main exhibit halls of the Long Beach Convention Center will be filled with boats. Ram Tugs will be unveiling new models only at the Fred Hall Long Beach Show. More than 400 seminars will be available, geared to anglers and outdoors enthusiasts of all experience levels. Presented by Progressive Insurance and by Hobie Kayaks, many of those seminars will be panel discussions. There are five main seminar venues: the Mammoth Lakes Ultimate Eastern Sierra Experience; the Cousins Tackle Ultimate Saltwater Experience; the Typhoon Ultimate Bass Fishing Experience; the Accurate Saltwater Tank; and, the fly-fishing seminar area and casting ponds. Two of the most anticipated seminars this year are the “Let’s Go Fishing So. California Fishing Basics” and the “Light Tackle Surf Fishing in So. California” pre-show seminars. If you are new to fishing or looking to expand your fishing horizons, the “Let’s Go Fishing So. California Fishing Basics” seminar is for you. Novice to mid-level anglers are encouraged to attend and learn from seasoned instructors how to become part of the 10 percent that catch 90 percent of the fish. The seminar will be held from 10:30 a.m. to 1 p.m. on Friday, March 6. For those who are interested in the growing trend of surf fishing, the “Light Tackle Surf Fishing in So. California” seminar will bring together legendary experts Bill Varneym, Jr., Patrick Sebile and Ruben Ortiz. Both seminars will provide rare insight into the fishing industry and cover topics such as: places to go fishing (including some secret spots), rigging methods for catching a variety of species, licenses and regulations, photographing your catch and teaching your kids to fish. The seminar is scheduled from 11 a.m. to 1 p.m. on Thursday, March 5. Both seminars cost $25, which includes show admission and a complimentary gift. Tickets are expected to sell out quickly and are available online only. Five members of the California Department of Fish and Wildlife’s (DFW) top leadership will participate in a panel where sportsmen and sportswomen can ask Fish and Wildlife leaders any questions they want. Director Charlton H. Bonham, Deputy Director of Wildlife and Fisheries Dan Yparraguirre, Chief of Law Enforcement David Bess, Chief of Fisheries Stafford Lehr and Marine Region Manager Craig Shuman will answer questions from the public on a variety of fish and wildlife related topics as part of a panel discussion taking place at 2 p.m. on Saturday, March 7 in the Mammoth Lakes Seminar Theater. Pete Gray, host of Let’s Talk Hook Up, Southern California’s premiere fishing radio show, will moderate the panel. Mammoth Lakes Kids Fish Free Trout Pond offer young anglers an opportunity to catch their very first fish at the shows. Kids’ Trout Fishing has been a tradition at the Fred Hall Shows for more than 50 years. The whole family will also enjoy the Ram Ultimate Air Dogs, The Great American Duck Races, Hobie Kayak lessons on the lagoon and Fishing in the City kids casting lessons. Other activities include air gun ranges, archery ranges, laser shot, lagoon casting, a climbing wall and a flight stimulator. Guests will want to make sure not to miss the much anticipated return of precision knife thrower Jack Dagger, King of the Fling. The Sporting Chef, Scott Leysath will return for his 16th year in the Costa Sporting Chef Café. If you aren’t familiar with Leysath, he is the host of the popular television show “Dead Meat” and a long-standing entertainer at the Fred Hall Shows. Leysath demonstrates how to prepare great fish and game recipes that are easy, fast and delicious. He shares the stage with Gary Shiebler, who plays some music and heckles Leysath while he is cooking — resulting in a great time for all attendees. Samples of Leysath’s work are offered throughout his performance. Chef Leysath will host a special “Gaffed” cooking segment once a day where two audience members will compete to prepare secret ingredients provided by the Sporting Chef who will also judge the competition. There may also be celebrity chefs “challenging” the Sporting Chef throughout the shows. The marine electronics section of the Fred Hall Show cannot be matched anywhere in the west. Several manufacturers will unveil marine electronics for the first time to Southern California boaters during the show. Shimano is bringing back the Reel Maintenance Seminars where Shimano technicians will teach you how to maintain your fishing reel by disassembling your fishing reel and learning how to perform a routine maintenance. The Reel Maintenance Seminars will take place Wednesday through Sunday, March 4 to 8, at 2 p.m., 4 p.m., 6 p.m. and 8 p.m. On Saturday, March 7, the seminars are scheduled for 11 a.m., 2 p.m., 4 p.m. and 6 p.m. On Sunday, March 8, the repair seminars will be at 11 a.m., 2 p.m. and 6 p.m. This area of the show features dozens of companies that will showcase their marine, hunting and bird watching optics. The hunting and shooting sports section of the Fred Hall Show has grown dramatically over the last several years. Premium firearm manufacturers, shooting ranges, hunting clubs and hunting lodges are well represented and will occupy the attention of the nearly 60 percent of Fred Hall Show attendees who participate in the shooting sports. Show hours are 1-9 p.m. weekdays, Saturday 10 a.m.-8:30 p.m., Sunday 10 a.m.-7 p.m.. Regular admission is $16 for adults, $15 for seniors age 62 and up, free for children 15 and younger with a paid adult, and free for active military personnel with a valid I.D.